Join Attallah College for a timely and pivotal discussion on what public high schools in Orange County can do to prepare students for the 21st century workforce. How do we educate students and parents about the realities of the current and future workplace? What are the advantages and disadvantages of career tracks and pathways in high school? How can we help all students meet UC and Cal State college admission requirements? 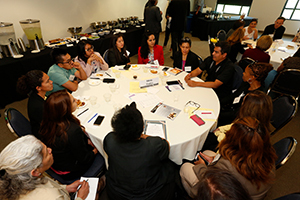 Education Roundtable5 on Excellent Schools will bring together educators, industry professionals, and community members to identify challenges and brainstorm collaborative solutions. Event includes a reception, special guest speaker, and panel and roundtable discussions with forward-thinking leaders in education. Free and open to the public, but preregistration is encouraged. In collaboration with partners from industry, academia, and philanthropy, Base 11 is deploying a STEM Accelerator model that transforms high-potential, low-resource college and high school students into the STEM talent that industry so desperately needs. Landon Taylor is an expert in business innovation and strategic market development, with 25+ years of experience as a corporate strategist. Under his leadership, Base 11 developed the world’s first droneport and autonomous systems research park and launched the country’s first collegiate rocketry league and $1 million Space Challenge competition. For the past 23 years, Vicki Braddock has been a principal at the elementary school, intermediate school, and high school levels. Prior to joining Los Amigos High School in Garden Grove, she taught at the elementary level and served as a middle school assistant principal. She believes that the ultimate goal as an educator, administrator, and lead learner is to ensure all students are college and career ready. With more than 18 years of educational and administrative experience, Edward Bustamante is the principal of Saddleback High School, a 7th–12th grade comprehensive IB World School in Santa Ana. Prior to joining Saddleback, Bustamante was principal of Gerald P. Carr Intermediate and Woodcrest Junior High. He has also worked as a junior high school assistant principal, high school assistant principal, high school counselor, physical education teacher, and varsity baseball coach as well as in social work as a former probation officer. Evelyn Castro is principal of Legacy College Prep in Santa Ana, the third Ednovate high school. She began her journey in education as a Teach for America corps member and founding teacher at Alliance Health Services Academy High School in South Los Angeles. Prior to joining Ednovate, she founded RISE (Rising Inner-City Students through Education), a program dedicated to providing students and families with college support and guidance, and served as assistant principal at Alliance Health. With more than 17 years of high school experience, both in the classroom and in school administration, Anthony Saba was hired as Samueli Academy's head of school in July 2012 and promoted to executive director in spring 2018. Saba began his career teaching high school business and math courses while coaching varsity football. After that, he held numerous administrative positions, including assistant dean, dean of students, athletic director, assistant principal, and principal.